I'm back! I realize it has been a long span of time since my last posting. My life took some unexpected turns and things were quite chaotic and crazy to say the least.....filled with some family issues, other personal issues and then the loss of my cat Travis-a-meow. I lost my creativity and was unable to do any crafting for a long span of time. I thought perhaps with the beginning of the new year, I would try to get back to doing some crafting. I was able to get a little bit of creativity back and have created several cards. I am just now finding time to post the cards. 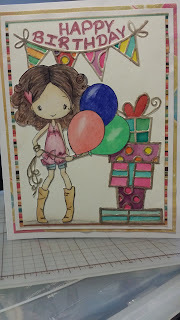 This card I used a stamp which is from The Greeting Farm and the stamp is from the Anya Collection. The background of the card is several design papers that were in my stash but I am not sure from what company. 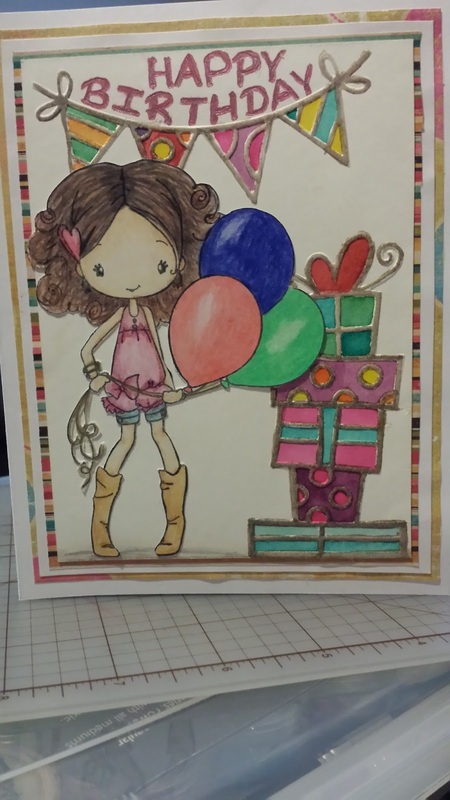 The birthday design background is an embossing folder I have. I think the embossing folder might be from Darice. I colored Anya from TGF with colored pencils and colored the embossed areas with water colors. I could not find a Birthday greeting that would bend with the decorated area in which I wanted the greeting to be in, so I free formed it with a sparkly gel pen.